The grapefruit (Chakotra) occupies a high place among the citrus fruits because of its flavour, appetizing properties and refreshing qualities. It is high in various antioxidants and disease fighting vitamin C. It has anticancer activity. The grapefruit occupies a high place among the citrus fruits because of its flavour, appetizing properties and refreshing qualities. The fruit grows in grape-like clusters of three or four to a dozen and a half and hence the name grapefruit. The fruit is often very large – larger than the human head. It vanes in colour and may have a pale yellow or pinkish flesh. The rind is usually quarter to half an inch thick. The heavier the grapefruit is in relation its size, the juicier it will be. The grapefruit tree is broad round-topped which reaches a height of 6.5 to 13 meters. Its branches are regular and covered with glossy, dark green leaves. Its large white flowers bloom during March, April and early May. The botanical name of grapefruit is Cirtus paradise. It is indigenous to Indo-China, Thailand and Malaysia. It has spread to other hot countries from these lands. It is now extensively grown in West Indies, Israel, Brazil, South Africa, Australia, New Zealand and U.S.A. It is a fruit of recent origin and has been developed from shaddock, the big sweet lemon, which is found all over India. The fruit is nutritive and cooling and possesses very much same properties as oranges, lemon and lime. An analysis of the grapefruit shows it to contain: moisture 92.0%, protein 0.7%, fat 0.1%, minerals 0.2%, carbohydrates 7.0%, per 100 grams of edible portion. Its mineral and vitamin contents are calcium 20 mg %, phosphorus 20 mg %, iron 0.2 mg % and thiamine 0.12mg %, vitamin C 3 1 mg %, per 100 gms of edible portion. It also contains a small amount of vitamins A and P. Its calorific value is 32. The seedless variety is the best as it often contains greater amount of sugar, calcium and phosphorus. Grapefruit is high in various antioxidants, especially disease-fighting vitamin-C. it has anti-cancer activity and is said to be particularly protective against stomach and pancreatic cancer. Grapefruit is an excellent appetizer. It promotes salivary and gastric secretion. It is an important health-builder and tonic. The juice of the fruit helps to fight with virus. Acidity: Inspite of often sharp, sub-acid taste, the fresh grapefruit has an alkaline reaction after digestion. The citric acid of tic fruit is very easily oxidized in the human system and hence the effect is to increase the alkalinity of the fluids of the body. It is therefore, beneficial in the prevention and treatment of acidity and many diseases caused by too much acid in the system. Digestive Disorders: The fruit is valuable to add bulk and to aid bowel action. It is beneficial in maintaining the health of intestines and is regarded as a preventive against dysentery, diarrhoea, enteritis, typhus and other infective diseases of the digestive tract. Influenza: The grapefruit is an excellent remedy for influenza as it helps to reduce acidity in the system and its bitter properties arising from a substance called “maringm” tones up the system and the digestive tract. Malaria: The grapefruit contains a natural “quinine” and hence is valuable in malaria. This quinine is also beneficial for Feverish colds. It can be extracted from the fruits by boiling a quarter of a grapefruit and straining the pulp. 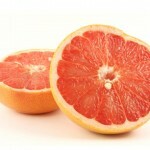 Scanty urination: The juice of grapefruit is extremely rich in Vitamin C and potassium. It can therefore, be beneficially used as medicine in scanty urination caused by liver, kidney and heart disorders. The grapefrui if taken in various ways. It is often used as salad and is taken together with other fruits and vegetables. It is sometimes cut into halves and the seeds and the hard pith are removed from the centre. The cavity is then filled with honey which is also sprinkled over the cut surface. It is left for one hour in a covered plate and then taken. It comes also as a fresh, canned and frozen fruit. It is also extensively dried and used in making squashes.